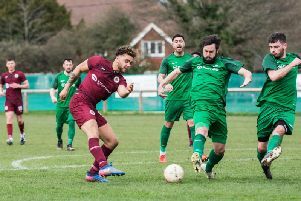 Lancing United Football Club are searching for a new manager following JJ Banasco-Zaragoza’s decision to step down in the wake of a fifth defeat from eight Southern Combination League Division 2 matches this season on Saturday. Banasco-Zaragoza, who took the reigns last November, watched his side slump to a 3-1 home defeat at the hands of Roffey, then decided to resign from his role. The departing manager guided United to a fourth-placed finish last term but cited commitments away from football as a major factor in his decision. Writing on his personal Twitter account following the defeat to Roffey, Banasco-Zaragoza said: “Decided to step down as manager of Lancing United. Thanks to all at the club for everything & the opportunity they gave me. Harri Nourse took a goal-kick in his path, before firing past Steve Allfrey to hand Roffey the lead after five minutes. Alastair Thompson then finished off a quick break from the visitors’ to make it two 27 minutes later. Mark Dixon pulled a goal back but Nourse’s second restored Roffey’s two-goal advantage 20 minutes from time. First-team players Allfrey and Dan Tuppen will be placed in caretaker charge, while a replacement is sought. Anyone interested in the vacant post should contact Ron George on 07842486572.